Our specialization Certificate in Psychoanalytic Psychotherapy helps you focus your professional development training. The theory and practice of Psychoanalytic Psychotherapy aims to help patients increase their awareness and understanding of their inner world and its influence over relationships. Psychoanalytic Psychotherapy is relevant to the conceptualization and treatment of a wide range of patients, from those with serious psychological disorders to those seeking greater fulfillment in their lives. The institute specialization Certificate in Psychoanalytic Psychotherapy allows the psychoanalytic clinician, as well as the novice, an opportunity to learn more about this field. 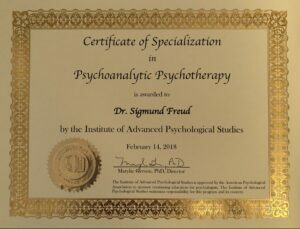 The field of Psychoanalytic Psychotherapy encompasses a variety of theoretical approaches and techniques, from the pioneering work of S. Freud, Abraham, and Fenichel, to the contemporary work of Kohut, Kernberg, Masterson, and Bollas. Whether or not you intend to specialize in this approach as a clinician, knowledge of it can enrich clinical judgment and skill. Consider the five metapsychological paradigms of S. Freud, as well as his views on defense mechanisms, perversions, neuroses, and psychoses in the course, Classical Psychoanalytic Theory. Learn more about the contributions of Hartmann and ego psychology theory in the course, Ego Psychology. Examine the unique contributions of Klein, Winnicott, Fairbairn, and Balint, in terms of both normal and pathological development, the significance of fantasy and creativity, and the importance of interpersonal dynamics for maturational processes, in Object Relations Theory. Review or become introduced to the breadth of the field in the course, Personality Disorders from a Psychoanalytic Perspective. Finally, learn more about the pivotal roles of and ways of working with transference, countertransference, resistances, defenses, and the therapeutic alliance in the course, Psychodynamics of the Therapeutic Relationship. To earn the specialization Certificate in Psychoanalytic Psychotherapy, take at least three of the five core courses noted above and add electives, until you have earned 48 continuing education credits. Eligible electives are being added continuously and currently include: Psychodynamics of Child Abuse and Trauma, Analytic Mindset, Intersubjectivity in Psychoanalysis, Consciousness and the Id, Jacques Lacan: Introductory Overview, and Intrapersonal Factors Promoting Diversity Tolerance. 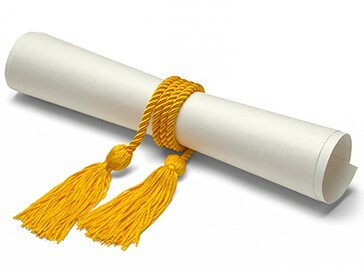 You may take the courses in any order and proceed as quickly as you wish. You have a full 7 years to complete the courses. To get started, simply enroll in a course. Contact us if you would like more information, have any questions, or wish to declare your intention to pursue a specialization.